As the Central Ohio beer scene matures an increasing number of breweries are releasing their beer in bottles and cans, with the latter emerging as the more popular format. Land Grant and Actual Brewing have recently purchased canning machines, Jackie O’s keeps expanding the number of canned offerings, while Seventh Son, Four String, Elevator, and most recently North High Brewing have used Buckeye Canning’s mobile canning line to package their product. The latest brewery to join the canning craze, Marengo’s Hoof Hearted Brewing, is perhaps the most anticipated. This past week four packs of their South of Eleven Double IPA started showing up on Central Ohio shelves, while later this month reigning “King of Ohio IPA” champion Musk of the Minotaur hits the shelves. 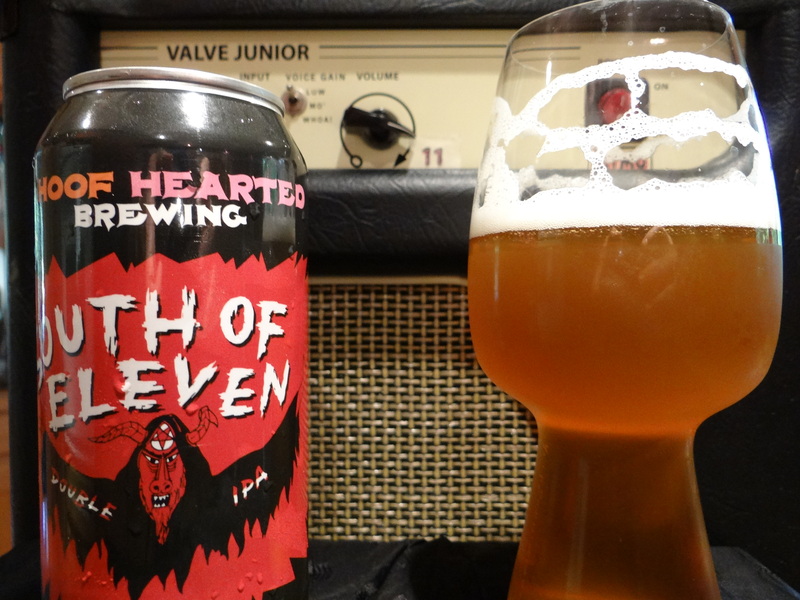 It would be a gross understatement to say that I’m jacked about South of Eleven being canned. It was one of 10 beers that made my 2014 Central Ohio Beers of the Year list, holding its own with Columbus Brewing Company’s GABF gold medal winning Imperial IPA Creeper. My yearning for a big dose of in your face new world hops was only heightened by a two week vacation spent on a cruise ship and in London, where double IPAs are about as common as all grass tennis courts are in Ohio. So one of the first things I did when I finally got back to Columbus was head down to Weiland’s Market and pick up a four pack of South of Eleven to satisfy my hop fix. Like all Hoof Hearted beers the label is designed and drawn by artist Thom Lessner. Anyone who has visited Dirty Frank’s Hot Dog Palace, where his paintings of rock stars and baseball players adorn the walls, will be familiar with his immediately recognizable style. The label for South of Eleven features some sort of levitating, robed upper torso of a demonic goat shaman about to cast a spell (at least that’s my interpretation and I’m sticking to it). Presumably the inspiration for this image is the Hoof Hearted logo, “dabbling in the dank and dark arts.” Lessner’s art may not be your cup of tea, but there’s no question that it gives Hoof Hearted beers a distinctive look. South of Eleven fills the glass with a hazy, translucent golden amber colored liquid topped by a big head of creamy, off-white foam. No need to stick my face in the glass to smell this beer, a big blast of dank, fruity hop goodness reaches my nose before the glass is even half full. The aroma is similar in character to hometown favorite Bodhi, which for those living outside the Buckeye state is very much in the vein of Vermont’s Heady Topper. If you’re not very familiar with any of these beers let me try to put it into words. Imagine if you will, coming across a kiosk that serves mango smoothies and freshly squeezed grapefruit juice, located at the intersection of a pine forest and a cannabis farm, while a clowder of cats marks their territory in the distance. The taste follows the nose with fruity hop goodness front and center, while flavors suggestive of a pine forest floor emerge toward the finish. For the most part the malts are a blank canvas for the hops, but there is a slight sweetness to them that is not unusual for a DIPA. Despite my earlier comparisons to Bodhi (8.5% abv) and Heady Topper (8.0% abv), South of Eleven (10.2% abv) is about 2 percentage points higher in alcohol, but you would never know that from the taste. The intense hop bitterness that is found in the finish of many DIPAs is absent, and the alcohol is masterfully hidden. It is dangerously drinkable for its potency. If beers had family reunions South of Eleven would be Bodhi’s big brother. The intense dank hoppiness may be too much for those of you who gravitate toward a balanced amber ale or a quaffable American wheat beer, but for those who like their IPAs dank and fruity South of Eleven is a world class beer not to be missed. According to a July 3 Hoof Hearted tweet all of the cans produced have been delivered to stores, so don’t hesitate to snag some or they will soon all be gone. Central Ohio locations that I know received shipments of South of Eleven include Weiland’s Market, Palmer Beverage, Savor Growl, Barrel and Bottle, Crafted Drafts, and Gentiles among others. In the Cincinnati area check Cappy’s in Loveland and HalfCut OTR.